Here are some Sneak Peeks as promised. This week as been a bit mad with way too much happening. So I am sorry that this is a bit late! First is Nat's page, it is a double layout but only one page is shown here. Next is the Sneak Peek of Belinda's pretty pink page. This one is mine, lots of little bits and pieces. Last is a sneak peek of our altered art project. Hope this gets you all inspired and ready for a full day of creativity and fun. See you all bright and early Saturday. PS I forgot to include pliers for attaching all the charms, so if you have a pair or two, please bring them. Well here is an update for the lovely 85 Ladies attending our all day scrap on August 24th. The official starting time is 9.30am sharp. The Church will be open from 9am for you to find a seat. Someone will in in the shop from 8am onwards. For those attending for the first time and a reminder for everyone else. You need to park across the road in the Church car park and not in ours. This is important as you do not want to get a parking ticket. Please follow any street signs in relation ship to parking around the Church, if you can't get a space in the Church car park. We have starting cooking up an amazing morning tea for all attending along with lunch. We will have a glutton free option as well. To help make the day amazing, you all need to have an early night, the night before, bring a water bottle and nibbles if you want. We have a full on day planed with four projects to get done before 4.30pm. This year Steph is unable to teach due to another commitment, so Belinda (one of our super talented card making teachers) is teaching a beautiful shabby chic layout. Colours are pink and white with a touch of blue. Nat is also having the day off due to an operation she has had. So Wonderful Kathy will be teaching Nat's double layout. Nat's layout has lots of different colours to work with. I will be teaching two projects, one is a male page and the other an altered art project. I will post some photos of the projects next week. Here is what the teachers would like you to bring. Charcoal chalk ink, a Border punch - we will have some for you to use if you don't have one of your own. Size of photos 2x 4x6 portrait photos - 3x 4x6 landscape photos. The theme of the page is travel with the title Adventure lies around every corner. Size of photo 4x6 portrait photo. The theme of the page is pretty with a bird cage and butterflies, title of the layout is Love. Vintage photo ink pad or chestnut roan or dark brown ink pad. 1x 4x6 Portrait photo. The page has a balloon theme so it will suite a couple or male person. The title is enjoy the ride. 1x 4x6 Portrait photo which can be cropped. I am using Graphic 45 paper with the title You and Me. For your basic kit, could you make sure you have the following items. Paper trimmer, Scissors / knife, Double sided tape, Glue, 3D foam tape or squares, a hole punch. Kraft knife. Pencil. Baby wipes. A tip for those attending for the first time. Find the lady with the biggest tote bag and sit next to her. 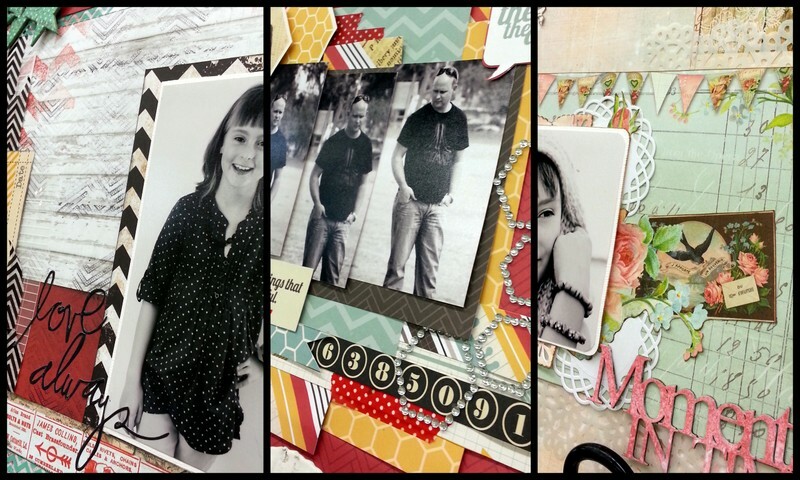 I have found scrapbooking Ladies to be very friendly people especially to new comers and happy to share!!! We will be doing the same thing as last year. On the tables in the store will be big sheets of paper, all you need to do is write your name on one and pile everything you want onto it. Sam will put the items through the till during the day. At the end of the day you will need to come over and pay. I am flying to Melbourne for the weekend, so I will post some photos of the projects early next week. Due to unforseen medical reasons ... this will be Nat's last class until October - come and create 3 simple pages in one night .... Monday 5th August at 7pm - Please bring photos to this class.